I’m so excited to start a new feature of interviewing authors and illustrators on my blog! Today we welcome Sam Smith, a local Pittsburgh children’s book writer. Sam’s book, Cate’s Magic Garden, is about a little caterpillar that brings a garden back to life through the power of positive thinking and kind words. I grew up in Randolph, NJ (about an hour outside of NYC) and went to college at the University of Virginia, where I earned my bachelor’s in English. I started my career in advertising in Baltimore, MD and then Capitol Hill, DC, working for several ad agencies as a media supervisor. Then I finally got brave and made the jump to copywriter; writing had been my passion since I was a little girl. I enjoyed working for an agency, but when I had the chance to strike out on my own, I did! I became a freelance writer in 2006, and in 2008, my husband and I and our 2-year-old son moved to Pittsburgh so my husband could follow his dream to work in his family’s business, a 117 year-old foundry in the heart of the city. We love the area, and I recently fulfilled another childhood dream, which was to publish a children’s book! I live with my husband, sons Sutter (12) and Graham (8) and kitten Penelope. Yes! Pretty much since I was six and told my parents I wanted to be Robert Frost when I grew up. My dad gently told me that it might be a difficult living. I’m happy to report that writing can be a great and exciting profession these days, especially since you can work from anywhere! Funny story: when I was ten, I wrote a poem about a butterfly….and my book is about a very similar one—I did not remember this coincidence until very recently. How did Cate come about? CATE was not born the way children’s books usually are—she came about rather backwards. My step-sister, Megan, put me in touch with my now co-author, Betsy Coffeen. Betsy is a dedicated Childhelp Wings Advisor and wanted to create a fundraiser for the organization, which helps prevent child abuse. We started with a story about a bunch of kids on the playground and a bullying situation, since that aligned nicely with Childhelp’s mission, but the story just didn’t feel right yet. Then the garden idea just popped into my head. First, we explored a world where a grumpy group of bugs dug holes with their negativity, literally. But this theme started getting too dark for a children’s book. That’s when my publisher had a great idea that turned the book and the entire message around. She harnessed the power of positivity and kindness. And we made the connection that words change worlds, which is a very powerful and exciting message. We were grateful to have Ginger Seehafer join our team and truly bring the story to life through her beautiful illustrations. And Rachel Eeva Smith helped create this inspiring book with her expert book design. Amy Cherrix of Two Hoots Press finally brought CATE’S MAGIC GARDEN out into the world, and she continues to be a huge champion of its message. Cate was published in connection with Childhelp. Can you tell us more about that? Childhelp is an amazing organization, founded in 1959 by two actresses, Yvonne Fedderson and Sara O’Meara from the popular tv show, The Adventures of Ozzie & Harriet. Since its inception, Childhelp has helped over 10 million victims of child abuse and neglect and is internationally renowned. Yvonne and Sara have both been honored by almost every president since Carter and were nominated for the Nobel Peace Prize eight times, among other important recognitions. Their work is vitally important, and I’m honored to support them. A portion of proceeds from the book go to Childhelp. Where can readers find you and your book? Me? Probably in a library, at my computer or on the soccer field! But seriously, CATE and I have been fortunate enough to visit several Pittsburgh area schools to talk about the power of positivity and kindness. 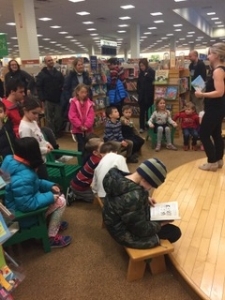 I’ve done a number of readings/signings at local bookstores, including Penguin Bookshop, Barnes & Noble, Riverstone Bookstore, Learning Express at the Galleria and Learning Express of Bakery Square. My books are also available at Malaprops in Asheville, NC; How To Live in Beach Haven, NJ; Cover to Cover in Columbus, OH and Book Soup in LA! You can find them online at Amazon.com and BarnesandNoble.com. Thanks for joining us, Sam! Be sure to check out her book!